SGX Day Traders: 2014 Apr 19---SGX Day Traders' view on STI index and trading strategies for next week. 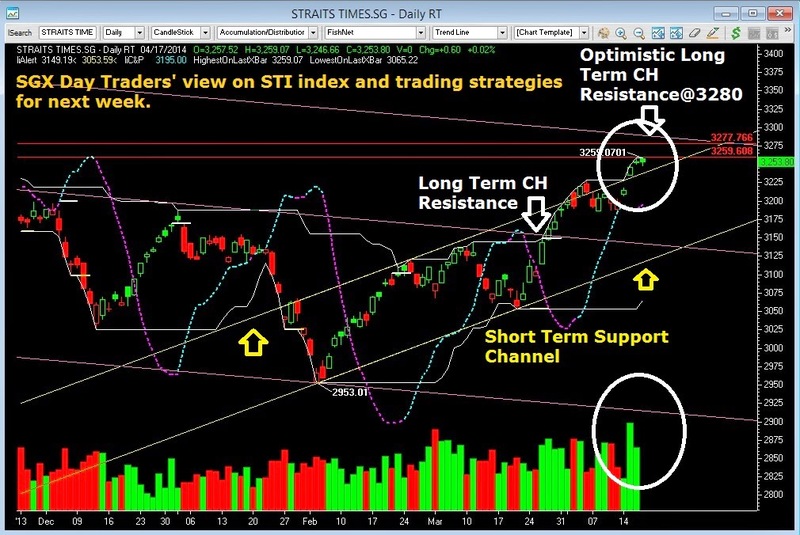 2014 Apr 19---SGX Day Traders' view on STI index and trading strategies for next week. STI after breaking up from long-term slopping down trend-line at 3130 as shown by arrow heard, STI suppose to peak at 3225, the secondary rebounding channel (Yellow), The Capitaland took CMA privatization jaked up the STI further because market participants now are "motivated" by more potential M&A on going. However from Chart view, STI may peak finally peak at key resistances between 3259 to 3277 the previously monthly high and the Primary downtrend channel measured from recent high at 3464. We will continues to urge members to continues sell into strength and only to chase high if STI break 3280 with convincing volume justifications. SGX Day Traders will continue to focus on 2nd and 3rd liners for intraday or swing trading opportunities with those counters with good Reward and Risk ratio set-up. Stay tuned to https://www.facebook.com/SgxDayTraders to receive our real-time update. PS: we will do our best to share as many as possible, however because of limited resources, is better to join our Live Trading Webinar to ensure you are not missing any opportunities.